I meet so many people that are absolutely in love with Costa Rica's natural beauty, the real estate in Costa Rica and the Costa Rican people and lifestyle. The question I get the most from those considering retiring to Costa Rica is, "What am I going to do with my free time if I move to Costa Rica?" Activity 1. Watch a Costa Rican soccer game. 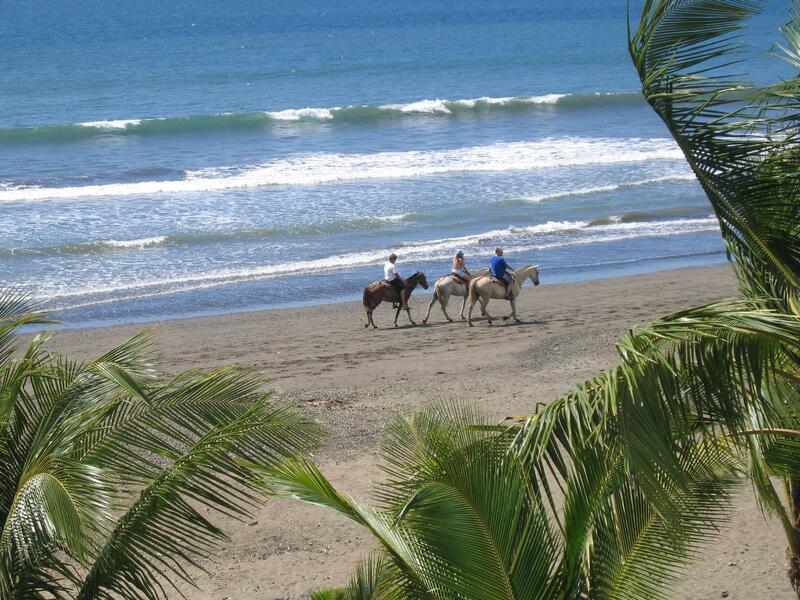 It's Costa Rica's national past time. Kind of like baseball, basketball and football put together. The Costa Rican people are very passionate about their sport and soccer (futbol) for all ages is fun and exciting not only to watch the game, but there is some great people watching. It also helps you to get familiar with the culture and allows you to mix with the locals, and if you are cheering for their team, gives you something in common. Always a great conversation starter. In Jaco, we have the Jaco Rays, a division 2 professional soccer team. It really is fun to go to the games, support the local community and cheer on the local team. Activity 2. Surf, Boogie Board or Watch the surfers. High tide happens twice each day. If you live in one of Costa Rica's beachfront communities, you are treated to some of the best surfing conditions and surfing waves in the world. Our local surfers and surf tourists are amazing athletes. Even 10 times World Champion, Kelly Slater is seen surfing in Jaco and Hermosa. The admission is free. Just jump on your board or pull up your beach chair and watch with amazement as these amazing athletes defy gravity and put on a great show! There is a local surf tournament every Saturday at 4pm at Backyard Bar in Playa Hermosa. Grab a drink, find some shade and watch with amazement! It is well worth attending! Activity 3. Watch a Costa Rican sunset. Costa Rica has some of the most amazing sunsets in the world. If you are retired, this is a great excuse to have a few friends over on your beachfront balcony for happy hour while you stare off into the Pacific Ocean. If you see the green flash, tomorrow will be a lucky day. If not, come back the next day and watch again. Actually, every day you are in Costa Rica is a lucky day. Admission is free, except for the tropical beverages, of course. Activity 4. Walk or run the beach. It's excellent exercise. It's also good for your mental health as you stare out into the calming blue of the Pacific Ocean, listen to beat of the surf, smell the fresh, salty air and let your eyes wander about. Admission is free. Just bring a hat and some sunscreen. Go early before the heat of the day or just before sunset. Activity 5. Explore Costa Rica. Costa Rica is rich with mountains, dirt roads and interesting small towns that are literally located in the middle of nowhere. Take a drive and do some exploring. Better yet, invest in an atv or one of the new multipurpose sport vehicles (like a golf cart on steroids). It's a great way to see the country. Middle Costa Rica is the real Costa Rica and each little town center has a soccer field, a church and a school next to the tiny local stores where you can get a water, Coke or even an Imperial (ice cold if you are lucky). Activity 6. Go Shopping. Escazu is the location of the Multiplaza Shopping Mall. This huge three story mall will make you feel like you are back home in the US or Canada. Sometimes when living in a small city or town, it feels good to spend a day in civilization. There are also excellent restaurants and specialty stores, movie theatres (even an IMAX) in Escazu and Santa Ana. After a day in the city, you will be glad to get back to your beach life once again. But it is good to know that it's only a short drive to civilization. Don't forget to go to Sarchi, a town known for wooden furniture. Each small town has its own unique personality so while in Costa Rica, please don't forget to buy local. Activity 7. Go to a museum. San Jose is filled with cultural activities and several museums. The museum of Gold is one of the popular ones to see with many ancient artifacts from Pre-Columbian times. If you have a family, the Children's Museum is worth seeing on a rainy day. Activity 8. Go to one of many art galleries. Costa Rica is home to some very talented local artists with an array of styles and media. Escazu is home to many galleries, but there are local artists throughout Costa Rica. Check in your locality for one close by. In Jaco, Felix Murillo's art has received a lot of attention. Jaco also hosts Art Prize. A local art festival with cash prizes. Artists come from all around Costa Rica (and internationally) with their best works. Activity 9. Go Golfing. Golf in Costa Rica is a year around sport. You will find excellent golf courses throughout the country from those in Santa Ana and the Central Valley to Guanacaste and the Central Pacific like La Iguana in Los Suenos. Activity 10. Go to a national park. Costa Rica has set aside approximately 17% of its land for National Parks (more than any other country) and there are many to choose from. In the Central Pacific near Jaco, Manual Antonio National Park is the most visited with about 90% of Costa Rica's National Park visitors. Want something a little more private and off the beaten path, try the Carara National Park near Tarcoles. There are a variety of paths for all ages and skill levels. You can see hundred year old trees, many species of butterflies, vibrant colored frogs, an occasional sloth or two and my favorite, the monkeys. Costa is minimal and varies by location. Note - most parks are not handicapped accessible, so call ahead if you have special needs. Activity 11. Visit a volcano. Costa Rica has several volcanoes; some active and more that are inactive. Visit Arenal Volcano, Costa Rica's most active volcano to hear the cannon like boom and see lava flows. Afterwards, relax in the hot springs at Tabacon. Poas is another National Park and you can drive up to the rim of the volcano, where the crater is 1.5km wide (one of the largest active craters in the world). Poas is busy on the weekends, so it is best to visit midweek. Activity 12. Volunteer. You can not only live in Paradise, but you can do your part to change the world at the same time. There are many projects and non-profit organizations in Costa Rica that need volunteers and financial assistance. If you have a specialty, you can share that with a local organization. We have clients of ours that volunteer at schools, preschools, donate school supplies and help to purchase uniforms. In Jaco, the Mckee Project is a non-profit that works to keep stray dogs off the streets. Others volunteer to help with beach and forest area clean up projects. Some others plant trees. Others go to low income neighborhoods and work with the children and the families in teaching them life skills. No matter your specialty, you can be sure that someone can benefit from the time that you spend giving back. Activity 13. Learn a craft and sell your wares at a local farmers market. Most communities in Costa Rica have a local farmers market. In Jaco, the feria or farmer's market is held every Friday at the municipal grounds near the soccer stadium. In addition to fresh fruits and vegetables and baked goods, craftsmen line up to sell their specialty products. You probably won't get rich, but it may give you something to do and give you another opportunity to mingle with the local crowd. Activity 14. Join a local expat club. There are many around Costa Rica and if there isn't one in the area you decide to settle, you can start your own club. If you don't know what is available or where to go, check with the local Chamber of Commerce or with your real estate agent. In Jaco, there's a group that gathers twice a week for horseshoes. There's a Woman's Group and also a Men's Group through the Chamber of Commerce that both meet once per month. I also hear of cribbage tournaments, poker nights, sewing clubs and many more. If your favorite past time isn't represented, then you can start one. Here is a link to the Jaco Central Pacific Chamber of Commerce (Cenpac) Women's Group outing to the turtle sanctuary in Hermosa. They are helping harvest turtle eggs and release new born turtles into the sea. Activity 15. Journal Your Adventures. You are living your dream life in paradise. It is an exciting and fulfilling time, so why not write about it? Costa Rica is a magical country that brings out the creative side in even the least creative people. Use some of your free time to write about your experiences. Who knows, maybe your journal will be sold to a New York publishing house for the next special Costa Rica Travel Guide or Costa Rica Expat Guide. No matter, you will have fun writing about all of your adventures! Activity 16. Create a Blog. Blogs are easy to create and don't cost anything. Start blogging about your Costa Rica adventures, post excerpts from your Costa Rican Journal or blog about the wildlife that you encounter. No matter what you topic, your friends and family from back home will love to read about your experiences while living in Costa Rica. Even though they think you are crazy for making the move, we all know that they are extremely jealous. Why not show them a little of what they are missing! Activity 17. Jaco Football League - Play American Flag Football. This is the inaugaral season for flag football in Jaco, Costa Rica. Presently there are four teams with about ten players each. It is six on six football played on a sixty yard field marked off at the municipal soccer field. Games are eighty minutes. Ages range from 25 to about 60 years old and are mostly gringos, but we do have some ticos that are playing and having a great time. Activity 18. Release Turtles at the Hermosa Turtle Refuge. Each year turtles return home to Hermosa and Jaco Costa Rica to lay their eggs. The eggs have so many predators, both human and animal that this refuge was established to rescue them and help to assure that the turtles survive and thrive in the Costa Rican waters in the Pacific Ocean. Volunteer to gather and incubate eggs and to help the baby turtles find their way into the sea. It is an experience you will never forget. The season is June through December. Activity 19. Bicycling. Great for all ages and skill levels. Hop on a bike and feel free and alive. Ride a beach cruiser for transportation along the beach, to your favorite pub or a trip to the grocery store. Ride for some moderate cardio exercise on the flat, beach roads (it's flat the entire 50 mile distance between Jaco and Quepos). Need an intense work out? Head up into the mountains. There are endless mountain trails waiting to test your agility and skill levels all the way up to the famous "La Ruta De La Conquistadores", (Route of the Conquistadors) mountain bike race where expert riders start in Jaco and ride to the Caribbean Coast. Ride early morning or late afternoon to avoid to mid day heat.